There are multiple kinds of transceiver module available for use with different types of wire, fiber, different wavelengths within a fiber, as well as for communication over different distances. The reason why the fiber optic transceiver received so much attention, because it has so many advantages in contrast to other way of communication, for example large capacity, long distance transmission, small size, light weight, easy to construct and keep, are less expensive and so on. In the following I must possess a brief introduction of 40G QSFP Module and CFP module. The 40GBASE QSFP+ (Quad Small Form-Factor Pluggable Plus) modules offer customers a multitude of high-density 40 Gigabit Ethernet connectivity options for data center, high-performance computing networks, enterprise core and distribution layers, and repair provider transport applications. Luxtera is a privately owned, fabless semiconductor company that claims to be the first company to successfully integrate high performance optics directly with silicon electronics on a CMOS chip to enable “fiber to chip” connectivity. Luxtera’s collaboration with Freescale Semiconductor has enabled high volume manufacturing of Si CMOS photonics chips using their HiPerMOS7 130 nm silicon-on-insulator (SOI) CMOS process, on a 200 mm line in Austin, USA. More recently, in March 2012, Luxtera announced its collaboration with STMicroelectronics to enable high volume manufacturing of Si CMOS photonics using STMicroelectronics’ PIC25G 65 nm process on a 300 mm platform in Crolles, France. 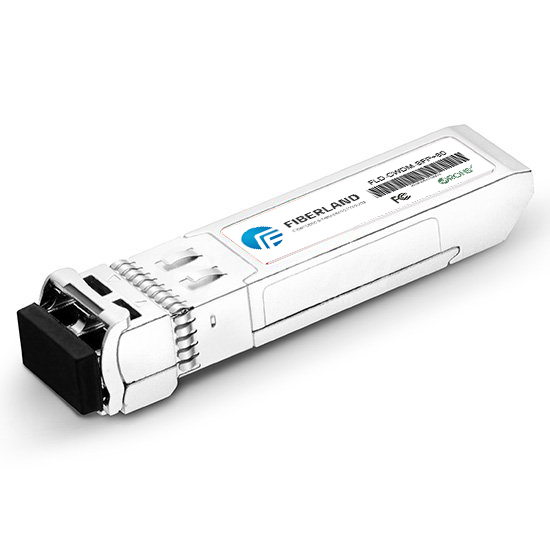 Fiberland QSFP+ (Quad Small Form-factor Pluggable Plus) is a new Multi-Source Agreement (MSA) for high speed application, such as 40G-BASE, which provide four channels of data in one pluggable interface. Each channel is capable of transferring data at 10Gbps and supports a total of 40Gbps. The 40Gbps QSFP+ transceiver is well suited for Infiniband and 40GBASE-SR4 / 40GBASE-LR4 applications. It combines the higher density attractions of parallel modules with some of the key advantages normally associated with SFP+ based modules. It is intended for use short reach applications in switches, routers and data center equipment where it provides higher density and lower cost when compared with standard.